In the last decades, interest among arthroscopic surgeons in using biodegradable interference screws has grown [1-12]. These screws are made from poly-lactid-acid-PLA, polyglycolide-PGA (e.g. poly-L-lactide acid (PLLA), or poly-DL-lactide acid (PDLLA)) alone or in composite with hydroxy-apatite and tricalcium-phosphate [1,3,5,11,13]. Offering similar fixation strength and outcome as metal interference screws, biodegradable interference screws promise to cause less graft damage at insertion and less artifacts in magnetic resonance imaging; generally, no removal of the screws is necessary . The evidence for the use of biodegradable interference screws in anterior cruciate ligament (ACL) reconstruction is still scarce. Although the screws promise to degrade in approximately 12-24 months after surgery, several cases have been reported in which this did not happen [1,10,15]. 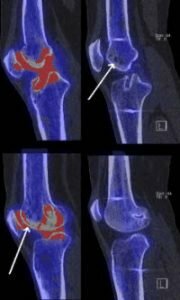 In most orthopaedic units, current diagnostic follow-up in patients having problems after ACL reconstruction include clinical examination, standardized radiographs, computerized tomography (CT), magnetic resonance imaging (MRI) [21-23]. Clinical examination is often not specific enough, and radiographs are only able to detect gross structural abnormalities, therefore these often fail to identify the origin of the patient’s pain. MRI is a sensitive imaging modality, but it has been reported that persistence of biodegradable interference screws is seen even though they have already been degraded . 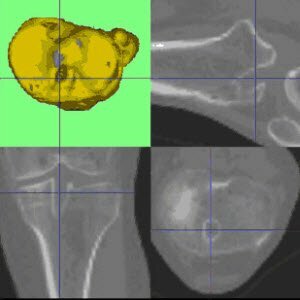 SPECT/CT combines the precise anatomical detail available with high spatial resolution CT and information on abnormal bone metabolism through single photon emission computerized tomography (SPECT) [24-28]. It holds promise in the potential assessment of the biology of the joint, particularly the bone-graft-fixation complex . To the best of our knowledge, there is no case report or study in the literature concerning the use of SPECT/CT in patients with pain after ACL reconstruction. With the case described, we strive to introduce SPECT/CT as new diagnostic imaging modality and illustrate the possible clinical value in patients after ACL reconstruction it may offer as new diagnostic radiologic modality. A 29-year-old woman sustained a valgus-hyperflexion injury of her left knee while skiing 2 years ago. 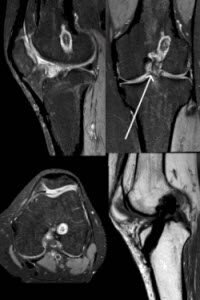 An ACL intrasubstance tear and a radial lesion of the lateral meniscus were diagnosed and treated by an arthroscopically assisted single-bundle ACL reconstruction using a bone-patellar tendon- bone (BTB) autograft 3 months after injury. The graft was fixed within the femoral and tibial tunnel using PLGA/TCP interference screws (Milagro™, Depuy MITEK, Spreitenbach, Switzerland). The Milagro interference screw is made of 30% β-TCP (tricalcium phosphate) and 70% PLGA (polylactic-co-glycolic acid). In addition, a partial lateral meniscectomy was performed. On the contralateral knee an ACL reconstruction using patellar tendon autograft had been performed 8 years before. At that time, the graft was fixed within the tibial and femoral tunnels using sutures around post screws. Six months after initial surgery, the patient underwent a revision arthroscopy with arthrolysis of the patellar ligament and Hoffa’s fat pad due to pain and limited flexion, which were attributed to scarring of the anterior joint interval and a patella infera. The patient’s problems did not resolve. Twelve months later, at initial presentation to our clinic, she still had limited flexion (<95°) and a patella infera. Climbing stairs caused excruciating anterior knee pain, and the knee felt unstable. Lachman and Slocum test showed a slight increase of anterior-posterior translation in relation to the contralateral knee. A firm endpoint was present. The MRI showed an intact ACL graft, a possible tibial cyclops lesion, and a patella infera. There was no increased fluid collection within the bone tunnels (Figure 1). Figure 1. The MRI (PDW FS sagittal, PDW FS coronal, PDW FS axial, T1 TSE sagittal) showed an intact continuity of the ACL graft and a possible tibial cyclops lesion. The 99mTc-HDP-SPECT/CT clearly identified a highly increased tracer uptake around and within the tibial and femoral tunnels and the patellofemoral joint (Figures 2,3). In addition, the femoral bone showed a diffuse patchy osteopenia. Figure 2. 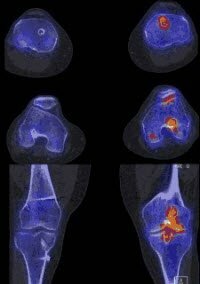 Sagittal, axial, and coronal reformation of right and left knee in 99mTc-HDP-SPECT/CT showing increased tracer uptake within the femoral and tibial tunnel and patellofemoral joint of the left knee. The right knee did not demonstrate any areas of increased tracer uptake. Figure 3. Sagittal, axial, and coronal reformation of right and left knee in 99mTc-HDP-SPECT/CT showing increased tracer uptake within the femoral and tibial tunnel and patellofemoral joint of the left knee. The right knee did not demonstrate any areas of increased tracer uptake. On the femoral side, the graft attached at a shallow (50% along the Blumensaat’s line) and high position according to Amis et al (Figures 4-7) . On the contralateral side, the graft complex, and the tibial and femoral tunnels showed no increased tracer uptake. Figure 4. CT out of the SPECT/CT data showing femoral and tibial bone tunnels 3D-CT analysis, which indicate a shallow and high placed ACL graft on the left knee. Figure 5. 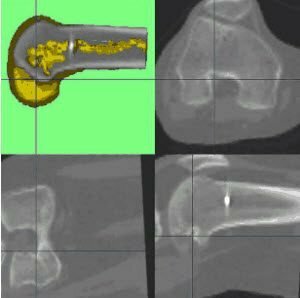 CT out of the SPECT/CT data showing femoral and tibial bone tunnels 3D-CT analysis, which indicate a shallow and high placed ACL graft on the left knee. Figure 6. On the right knee the femoral tunnel is placed far more posterior. The tibial tunnels indicate a proper graft placement. Figure 7. On the right knee the femoral tunnel is placed far more posterior. The tibial tunnels indicate a proper graft placement. At revision arthroscopy, a diffuse hypertrophy of the synovium, scarring of the Hoffa fat pad, and a cyclops lesion of the former ACL graft were found, causing graft to notch roof impingement in extension and a substantial flexion deficit. The interference screws were partially degraded, and under palpation and pressure, a grey fluid-like substance drained into the joint. The Milagro interference screws were removed. We performed a debridement of the ACL graft and an arthrolysis, in particular of the anterior patellar ligament interval. The histologic examination of the degraded screw material and removed fibrous tissue showed typical findings of a foreign body reaction (Figure 8). Microbiologic specimens were normal. Figure 8. 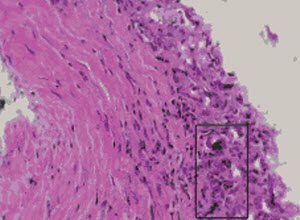 Histopathologic examination using hematoxylin & eosin of the degraded screw material showing foreign body reaction. Intra-operatively, full extension and flexion of 135° was regained. The patient fully recovered from surgery and was pain free as she was with her right knee, which had undergone ACL reconstruction using post-screw-graft fixation. The most important finding of the present case was twofold. Firstly, we reported the case of a painful knee due to a foreign body reaction and degradation under pressure after ACL graft fixation using biodegradable interference screws. According to Frosch et al, one could expect that the used interference screws would be entirely degraded and partially incorporated 18 months after ACL reconstruction [1,10,15]. The authors investigated the in vivo degradation and biocompatibility of the same interference screw as in our case report. In a series of 12 patients after arthroscopic ACL reconstruction using hamstring tendon grafts, serial MR imaging was performed at 3, 6, and 12 months after surgery [1,10,15]. At 12 months post-operatively, the average volume loss of the tibial and femoral screws was 83 ± 17% and 92 ± 6%, respectively [1,10,15]. The screws were entirely degraded and only remants were identifiable [1,10,15]. Although the Milagro screw is considered to be biocompatible and osteoconductive, the femoral and to a lesser degree the tibial screw in the present case did not degrade and caused a foreign body reaction, which was confirmed by histology. This is in line with others describing inflammatory or foreign body reactions after use of biodegradable screws [1,7,10,13]. In which patients and under which condition and environment the degradation of this biodegradable interference screw causes a foreign body reaction and related arthrofibrosis remains unclear. A number of factors, such as the polymers and copolymers, the size of the screw, the position of the interference screw, and the sterilization, are considered to be key factors for the degradation of biodegradable screws . Also the angulation of the tunnel, location of tunnel entrance, the angle and depth of graft fixation and the joint metabolism might be of influence, not only for the degradation process, but also for the graft tension [21,31,32]. In the present case, the problem seems to have been caused by a combination of improper graft placement, delayed degradation of the used interference screws, and biological factors that could not be elucidated. The too shallow and high graft placement might have led to impingement and, thus, chronic intra-articular inflammation. Secondly SPECT/CT may facilitate the establishment of diagnosis, process of decision making, and further treatment in patients with knee pain after ACL reconstruction. The combination of structural, functional, and metabolic information helped to establish the cause of the patient’s pain [25,26]. 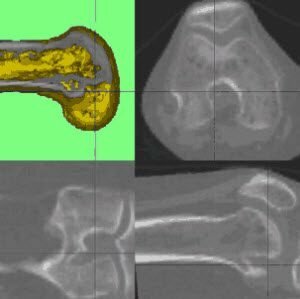 Marchant et al investigated the intra- and inter-observer reliability in identifying bone tunnels and assessing tunnel widening on radiographs, MRI, and CT . They showed that CT was most reliable. Radiographs and MRI were not reliable, even for simply identifying the presence of a bone tunnel . Without the use of SPECT/CT, the decision to debride the ACL graft and remove the interference screws would have not been made. Three-dimensional reconstructions of CT provide the surgeon with a better understanding of patient’s anatomy . The position of the tunnels, the orientation of the graft, and the localization of attachment area can be assessed, which have been reported to be decisive for outcome after ACL reconstruction [33,34]. In the present case, 3D-CT out of the SPECT/CT data was used to accurately evaluate the tunnel placement in relation to standardized frames of reference. Hogervorst et al found that scintigraphic tracer uptake correlated significantly with tibial tunnel enlargement and location of the tibial tunnel . They concluded that bone scintigraphy is a reliable method assessing the complex biology of graft remodeling, tunnel enlargement, and osseous homeostasis . In contrast to scintigraphy or SPECT alone, SPECT/CT can accurately allocate the tracer uptake to anatomic areas – for example, tibiofemoral or patellofemoral joint, tibial and femoral tunnels. Michael T. Hirschmann, Tom Adler, Niklaus F. Friederich, and Markus P. Arnold are from the Department of Orthopaedic Surgery and Traumatology, Kantonsspital Bruderholz, Bruderholz, Switzerland. Helmut Rasch and Rolf W. Hügli are from the Institute for Radiology and Nuclear Medicine, Kantonsspital Bruderholz, Bruderholz, Switzerland. Hirschmann MT, Adler T, Rasch H, Hügli RW, Friederich NF, Arnold MP. Painful knee joint after ACL reconstruction using biodegradable interference screws- SPECT/CT a valuable diagnostic tool? A case report. Sports Medicine, Arthroscopy, Rehabilitation, Therapy & Technology 2010, 2:24 doi:10.1186/1758-2555-2-24. © 2010 Hirschmann et al; licensee BioMed Central Ltd. This is an Open Access article distributed under the terms of the Creative Commons Attribution License (), which permits unrestricted use, distribution, and reproduction in any medium, provided the original work is properly cited. Frosch KH, Sawallich T, Schutze G, Losch A, Walde T, Balcarek P, Konietschke F, Sturmer KM: Magnetic resonance imaging analysis of the bioabsorbable Milagro interference screw for graft fixation in anterior cruciate ligament reconstruction. Strategies Trauma Limb Reconstr 2009, 4(2):73-79. Zheng N, Price CT, Indelicato PA, Gao B: Tibial fixation of bone-patellar tendon-bone grafts in anterior cruciate ligament reconstruction: a cadaveric study of bovine bone screw and biodegradable interference screw. Am J Sports Med 2008, 36(12):2322-2327. Kwak JH, Sim JA, Kim SH, Lee KC, Lee BK: Delayed intra-articular inflammatory reaction due to poly-L-lactide bioabsorbable interference screw used in anterior cruciate ligament reconstruction. Arthroscopy 2008, 24(2):243-246. Jarvela T, Moisala AS, Sihvonen R, Jarvela S, Kannus P, Jarvinen M: Double-bundle anterior cruciate ligament reconstruction using hamstring autografts and bioabsorbable interference screw fixation: prospective, randomized, clinical study with 2-year results. Am J Sports Med 2008, 36(2):290-297. Herbenick M, Gambardella R: Revision anterior cruciate ligament reconstruction using a unique bioabsorbable interference screw for malpositioned tunnels. Am J Orthop (Belle Mead NJ) 2008, 37(8):425-428. Zantop T, Weimann A, Wolle K, Musahl V, Langer M, Petersen W: Initial and 6 weeks postoperative structural properties of soft tissue anterior cruciate ligament reconstructions with cross-pin or interference screw fixation: an in vivo study in sheep. Arthroscopy 2007, 23(1):14-20. Park MC, Tibone JE: False magnetic resonance imaging persistence of a biodegradable anterior cruciate ligament interference screw with chronic inflammation after 4 years in vivo. Arthroscopy 2006, 22(8):911. e911-914. Sanchis-Alfonso V, Tinto-Pedrerol M: Femoral interference screw divergence after anterior cruciate ligament reconstruction provoking severe anterior knee pain. Arthroscopy 2004, 20(5):528-531. Morgan CD, Gehrmann RM, Jayo MJ, Johnson CS: Histologic findings with a bioabsorbable anterior cruciate ligament interference screw explant after 2.5 years in vivo. Arthroscopy 2002, 18(9):E47. Martinek V, Seil R, Lattermann C, Watkins SC, Fu FH: The fate of the poly-L-lactic acid interference screw after anterior cruciate ligament reconstruction. Arthroscopy 2001, 17(1):73-76. Fink C, Benedetto KP, Hackl W, Hoser C, Freund MC, Rieger M: Bioabsorbable polyglyconate interference screw fixation in anterior cruciate ligament reconstruction: a prospective computed tomography-controlled study. Arthroscopy 2000, 16(5):491-498. Marti C, Imhoff AB, Bahrs C, Romero J: Metallic versus bioabsorbable interference screw for fixation of bone-patellar tendon-bone autograft in arthroscopic anterior cruciate ligament reconstruction. A preliminary report. Knee Surg Sports Traumatol Arthrosc 1997, 5(4):217-221. Martinek V, Friederich NF: Tibial and pretibial cyst formation after anterior cruciate ligament reconstruction with bioabsorbable interference screw fixation. Arthroscopy 1999, 15(3):317-320. Zantop T, Weimann A, Schmidtko R, Herbort M, Raschke MJ, Petersen W: Graft laceration and pullout strength of soft-tissue anterior cruciate ligament reconstruction: in vitro study comparing titanium, poly-d,l-lactide, and poly-d,l-lactide-tricalcium phosphate screws. Arthroscopy 2006, 22(11):1204-1210. Radford MJ, Noakes J, Read J, Wood DG: The natural history of a bioabsorbable interference screw used for anterior cruciate ligament reconstruction with a 4-strand hamstring technique. Arthroscopy 2005, 21(6):707-710. Stener S, Ejerhed L, Sernert N, Laxdal G, Rostgard-Christensen L, Kartus J: A Long-Term, Prospective, Randomized Study Comparing Biodegradable and Metal Interference Screws in Anterior Cruciate Ligament Reconstruction Surgery: Radiographic Results and Clinical Outcome. Am J Sports Med 2010. Shen C, Jiang SD, Jiang LS, Dai LY: Bioabsorbable versus metallic interference screw fixation in anterior cruciate ligament reconstruction: a meta-analysis of randomized controlled trials. Arthroscopy 26(5):705-713. Stockheim M, Most-Ehrlein S, Rothschenk HJ, Wirbel R: [Cartilage damage caused by a dislocated resorbable interference screw of poly(L-lactide) 46 months after anterior cruciate ligament reconstruction]. Z Orthop Unfall 148(1):44-48. Baums MH, Zelle BA, Schultz W, Ernstberger T, Klinger HM: Intraarticular migration of a broken biodegradable interference screw after anterior cruciate ligament reconstruction. Knee Surg Sports Traumatol Arthrosc 2006, 14(9):865-868. Sassmannshausen G, Carr CF: Transcutaneous migration of a tibial bioabsorbable interference screw after anterior cruciate ligament reconstruction. Arthroscopy 2003, 19(9):E133-136. 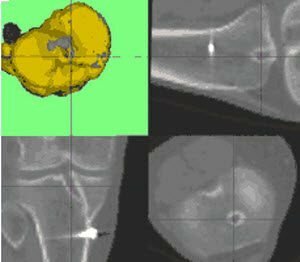 Marchant MH Jr, Willimon SC, Vinson E, Pietrobon R, Garrett WE, Higgins LD: Comparison of plain radiography, computed tomography, and magnetic resonance imaging in the evaluation of bone tunnel widening after anterior cruciate ligament reconstruction. Knee Surg Sports Traumatol Arthrosc 2009, 18(8):1059-64. Inoue M, Tokuyasu S, Kuwahara S, Yasojima N, Kasahara Y, Kondo E, Onodere S, Yasuda K: Tunnel location in transparent 3-dimensional CT in anatomic double-bundle anterior cruciate ligament reconstruction with the trans-tibial tunnel technique. Knee Surg Sports Traumatol Arthrosc 2009, 18(9):1176-83. Webster KE, Feller JA, Elliott J, Hutchison A, Payne R: A comparison of bone tunnel measurements made using computed tomography and digital plain radiography after anterior cruciate ligament reconstruction. Arthroscopy 2004, 20(9):946-950. Hirschmann MT, Davda K, Iranpour F, Rasch H, Friederich NF: Combined single photon emission computerized tomography and conventional computerized tomography (SPECT/CT) in patellofemoral disorders – a clinical review. Int Orthop 2010, in press. Hirschmann MT, Davda K, Rasch H, Arnold MP, Friederich NF: Clinical value of combined single photon emission computerized tomography and conventional computer tomography (SPECT/CT) in sports medicine. Sports Med Arthrosc Rev 2010, in press. Hirschmann MT, Iranpour F, Davda K, Rasch H, Hugli R, Friederich NF: Combined single-photon emission computerized tomography and conventional computerized tomography (SPECT/CT): clinical value for the knee surgeons? Knee Surg Sports Traumatol Arthrosc 2010, 18(3):341-345. Hirschmann MT, Iranpour F, Konala P, Kerner A, Rasch H, Cobb JP, Friederich NF: A novel standardized algorithm for evaluating patients with painful total knee arthroplasty using combined single photon emission tomography and conventional computerized tomography. Knee Surg Sports Traumatol Arthrosc 2010, 18(3):939-944. Konala P, Iranpour F, Kerner A, Rasch H, Friederich NF, Hirschmann MT: Clinical benefit of SPECT/CT for follow-up of surgical treatment of osteochondritis dissecans. Ann Nucl Med 2010, in press. Amis AA, Jakob RP: Anterior cruciate ligament graft positioning, tensioning and twisting. Knee Surg Sports Traumatol Arthrosc 1998, 6(Suppl 1):S2-12. Ma CB, Francis K, Towers J, Irrgang J, Fu FH, Harner CH: Hamstring anterior cruciate ligament reconstruction: a comparison of bioabsorbable interference screw and endobutton-post fixation. Arthroscopy 2004, 20(2):122-128. Ahn JH, Lee SH, Yoo JC, Ha HC: Measurement of the graft angles for the anterior cruciate ligament reconstruction with transtibial technique using postoperative magnetic resonance imaging in comparative study. Knee Surg Sports Traumatol Arthrosc 2007, 15(11):1293-1300. Arnold MP, Verdonschot N, van Kampen A: ACL graft can replicate the normal ligament’s tension curve. Knee Surg Sports Traumatol Arthrosc 2005, 13(8):625-631. Tomczak RJ, Hehl G, Mergo PJ, Merkle E, Rieber A, Brambs HJ: Tunnel placement in anterior cruciate ligament reconstruction: MRI analysis as an important factor in the radiological report. Skeletal Radiol 1997, 26(7):409-413. Behrend H, Stutz G, Kessler MA, Rukavina A, Giesinger K, Kuster MS: Tunnel placement in anterior cruciate ligament (ACL) reconstruction: quality control in a teaching hospital. Knee Surg Sports Traumatol Arthrosc 2006, 14(11):1159-1165. Hogervorst T, van der Hart CP, Pels Rijcken TH, Taconis WK: Abnormal bone scans of the tibial tunnel 2 years after patella ligament anterior cruciate ligament reconstruction: correlation with tunnel enlargement and tibial graft length. Knee Surg Sports Traumatol Arthrosc 2000, 8(6):322-328. Next articleIs Computer Navigation Necessary for Acetabular Component Positioning?